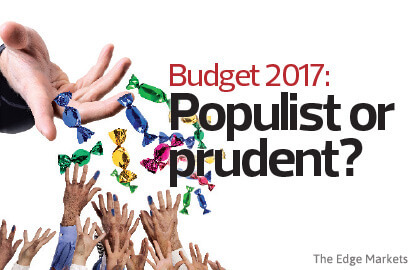 Cover Story: Budget 2017:Populist or prudent? IT is that time of the year again — budget time. With the 14th general election looming in the horizon, expectations are running high for goodies to be aplenty. But Budget 2017 may also prove to be the most challenging for Prime Minister Datuk Seri Najib Razak’s administration to draw up. The Goods and Services Tax will barely cover the RM10 billion to RM12 billion shortfall created by the falling petroleum revenue. On top of that, the government now has to contend with declining tax receipts from corporates and individuals as the economy slows (see “Tax hikes essential to fill coffers but may be detrimental to growth” on Page 72). Even the revised budget that slashed RM9 billion earlier this year has not been enough. The first-half budget deficit is estimated to have risen to 5% of gross domestic product (GDP). Already, scepticism about the government’s deficit target of 3.1% of GDP is growing. “For this year, we are forecasting a slightly higher budget deficit of 3.2% of GDP, as opposed to the government’s estimate of 3.1%,” says Sagarika Chandra, director of Fitch Rating’s Sovereigns team. Sagarika concurs that the government’s high contingent liabilities are another potential risk to public sector finances. To be fair, this is not the first time Najib’s administration has been tested. In fact, his first year in office saw him administer Budget 2010 during the post-global financial crisis recession. It will be argued that the Malaysian economy is still forecast to grow at least 4% this year. In contrast, it contracted by 1.7% in 2009. But there are several key differences. Firstly, while federal debt shot up in 2010 to 53.3% of GDP, it was still relatively manageable in absolute terms — only RM362.37 billion. Driven by a quick rebound in crude oil prices and an influx of foreign liquidity that lifted asset prices, the economy would see a sharp V-shaped recovery in 2010. Najib’s administration had plenty of headroom for an expansionary budget. Today, the government faces a decelerating economy, as opposed to a recovering one. Furthermore, the federal debt has since risen 80% since to RM655.7 billion as at June 30, 2016, or 53.4% of GDP. Secondly, Najib did not have to contend with an upcoming general election back in 2009. Historically, pre-election budgets have seen some of the biggest handouts, particularly to the low-income groups and the perceived “vote banks” like the civil servants and police and armed forces personnel. “Yes, I think Budget 2017 will likely be a pre-election budget. It should have a strong focus on the lower-income group and the middle class,” says Credit Suisse economist Michael Wan. In Budget 2013, a RM250 payout for eligible households and individuals cost the government RM3 billion. By Budget 2016, BR1M has expanded substantially to cost RM4.9 billion. Recall that households earning less than RM3,000 a month received a RM950 payout. Those earning between RM3,000 and RM4,000 a month got RM750. Meanwhile, individuals over 21 with a monthly income not exceeding RM2,000 received RM350. While this is certainly a popular move, such cash transfers are still positive for the economy. “The good thing is that the marginal propensity to consume for the low-income group is very high at almost 100%. This gives good returns to the government as it boosts consumption,” says Dr Yeah Kim Leng, a veteran economist who now lectures economics at Sunway University Business School. He also sits on the Monetary Policy Committee, weighing in on interest rate decisions. While BR1M may be the flashiest budget goody, it is hardly the only one. In Budget 2013, wage hikes for civil servants cost RM1.5 billion. Meanwhile, some 224,000 retired army personnel received RM1,000 each, amounting to RM224 million in total. On top of that, the government did not pinch pennies when it came to certain projects. Other than the mega infrastructure projects like the mass rapid transit, the government also allocated RM1.5 billion for agriculture projects and RM3.7 billion for technical and vocational training in 2013. Looking ahead, the public balance sheet may yet forgive another round of populist policies. After all, the government has played almost every card it has to boost revenue. Apart from major hikes in sin taxes, major cash-rich industries like the telecommunication companies were also tapped. The spectrum reallocation exercise, which will be concluded this year, will raise about RM6.3 billion (RM2.7 billion upfront, RM3.6 billion over 15 years). The only major area left for the government to boost revenue in a meaningful way is through asset sales, says Yeah. On a more positive note, Budget 2017 should be easier to draw up, says Wan, pointing out that the volatility in oil prices has subsided substantially. In fact, Saudi Arabia last week appeared to relent on its “pump-at-will” policy at an Organization of the Petroleum Exporting Countries meeting, lending some support to oil prices. Even if a formal deal has not been reached, the change of tack by the world’s largest oil producer will stabilise prices. Meanwhile, the government may not need to worry too much about spending to stimulate economic growth. After all, it still has one card up its sleeve — monetary policy. At 3%, the overnight policy rate gives Bank Negara Malaysia some room to manoeuvre. “With limited scope for a big expansionary budget, we think the need for a looser monetary policy via lower interest rates is greater,” says Affin Hwang Asset Management’s head of equity strategies Gan Eng Peng. He also points out that the government may use unconventional means to stimulate the economy such as the optional cut to Employees Provident Fund contributions to encourage consumer spending. “In the last year, we have seen surprisingly large tax bills for the beverage and power sectors. This should continue and is a risk. Sectors to be careful of around budget time are those that generate profits from the mass population. These include power companies, toll road and gaming,” says Gan. “The challenge in Budget 2017 will be less about cutting and rationalising expenditure, as was the case in 2015 and 2016, but more about prioritising competing demands for budget increases, given the rising likelihood of an early 2017 election,” says Wan. In a nutshell, the government should be able to afford another populist budget. At the very least, a moderate one. But should it? Pre-election goodies will certainly bring some cheer to voters, and it may even boost the economy in the short term. However, it could come at the expense of long-term development. It simply does not address productivity and income growth in the future. Petroliam Nasional Bhd (Petronas) is a microcosm of this dilemma. Prior to the fall in oil prices, the national oil company paid out massive dividends to the government — as high as RM30 billion a year after the global financial crisis. The short-term payouts may come at the cost of long-term growth. A consortium led by Petronas last week was given the green light to go ahead with a US$27 billion liquefied natural gas plant in Canada. But the group’s profit has taken a beating from the low oil prices, down 96% year on year in 2Q2016 to RM348 million. Yet, Petronas is still expected to pay RM16 billion in dividends this year. In this instance, the dividend payment may, to a certain extent, weaken the group’s capacity to invest. Likewise, the country has seen some cuts that may affect long-term growth. Some of the controversial cuts made in the revised Budget 2016 was in education. Recall that 744 scholarships were terminated to save RM240 million. If these are the proverbial low-hanging fruits when it comes to cost cutting, what will be reduced next? In fact, some may argue that the government is cutting areas that need the most investment. The rakyat would not be so dependent on cash handouts to make ends meet if their earning power was growing at a modest pace. For wages to improve, however, higher skills and productivity are needed, and this requires heavy investment in education and training. After all, it is better to teach a person to fish. But with so many hungry mouths to feed, Najib’s administration may find itself in an unenviable position in seeking the right balance with Budget 2017. As the economic weather turns harsher, it is natural that the man in the street is hoping for some Budget goodies, like lower taxes or levy waiver, to alleviate the pain of the high cost of living. On the other hand, there are concerns that the goodies may possibly cause long-term sufferings to the rakyat when fiscal discipline is not a top priority. The sharp depreciation of the ringgit against the US dollar last year remains fresh in memory. A wise government would first plug the leakages and the savings would provide additional funds to help the rakyat weather the current tough times. As late British Prime Minster Margaret Thatcher once said, there is no such thing as government money, it is taxpayers’ money. Spend the taxpayers’ money wisely and the votes will come your way.